CIRCA 1919 - French soldiers ride horseback to Juvigny. 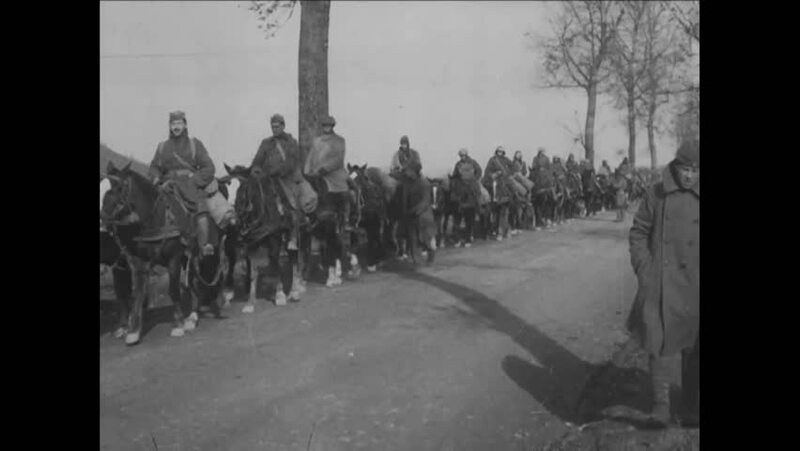 hd01:15CIRCA 1918 - Mule-drawn wagons carry 26th Infantry troops and equipment as they travel through the Ansauville Sector of France during World War 1.
hd01:08CIRCA 1918 - The 149th Field Artillery marches toward Luneville, the 165th Infantry passes through Baccarat and ambulances of the 117th Sanitary Train leave Bertrichamp in France during World War 1.
hd00:56CIRCA 1919 - As part of a maneuvers exercise in Germany, the 12th Machine Gun Battery marches. hd01:11CIRCA 1930s - The logging industry in Quebec Canada in 1937 in winter. hd01:30CIRCA 1950s - Tanks and the infantry moves up towards the aggressor on the battlefield to open the attack in 1954.